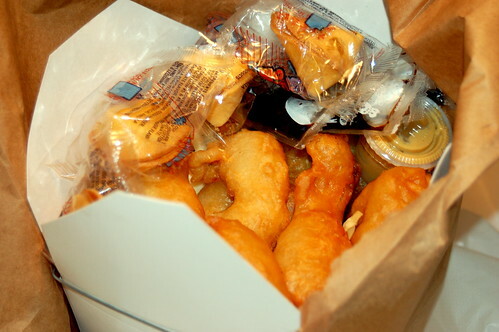 How Authentic Is American Chinese Food? "If you showed one of these iconic white pails to people in China, they might scratch their heads. The little boxes were patented on November 13, 1894 in Chicago by the not-so-Chinese inventor Frederick Weeks Wilcox (who wanted to improve the wooden oyster pails commonly used to transport raw mollusks from fish markets). They’re distinctly American—as is the takeout packed inside them. Chinese restaurants first started popping up in America in the mid-1800s when immigrants—mostly from present-day Guangzhou—flocked to California during the Gold Rush. The eateries spread, and by the 1920s, Chinese restaurants were featuring two menus: one with traditional fare; the other an Americanized version. The latter menu, which featured foods doused in sweet, salty, syrupy sauces, became a cuisine all its own. For example, the broccoli, tomatoes, carrots, and yellow onions found at American Chinese restaurants aren’t part of traditional Chinese cooking. (Tomatoes and broccoli aren’t even native to China!) That General Tso’s chicken you adore? American. Those fortune cookies? Not just American, but based on Japanese crackers. Chinese food is so ingrained in American culture that there are more Chinese restaurants in the U.S. than there are McDonald’s." What we view as culturally authentic may really not be when distinctiveness is sacrificed in order to gain mass appeal. There are approximately 21 million college students studying within the United States. Of those 21 million students, 4 out of 10 are American ethnic minorities and international students. Within the state of California alone, there are almost 2.7 million students. This is an amazing 13% of the country's total! Of these students, nearly 1.7 million are American ethnic minorities and international students. Texas has over 1.5 million students in the state, including nearly half a million Hispanic students. Primarily due to the presence of New York City, close to 1.3 million students attend college in the state of New York. Almost 600,000 of them are American ethnic minorities and international students. The number of Native American students across the country is approaching 200,000. Asian American/Pacific Islander now number close to 1.2 million students. There are 2.8 million African Americans on our campuses, over 13% of all students. Hispanics and Latinos are rapidly growing in number and influence and now comprise well over 13% of all students, totaling over 2.8 million students. The number of international students currently studying in the U.S. is nearing one million. In demonstration of the country's increasing cultural diversity, almost half a million of America's college students define themselves as being multi-ethnic. Another 1.3 million students do not self-identify as belonging to any particular ethnic group nor do they define themselves as being multi-ethnic. Students of European descent are still in the overall majority with 11.2 million. If current trends hold true, however, there will be no ethnic majority within the next few years. What does this all mean? The college campuses of the United States are becoming more diverse, the coasts are rapidly growing and our cities are home to many of the nation's students. In order to reach these students, campus ministries like those that I work with need to adopt new approaches that will effectively reach: 1) students of color; 2) those that speak a primary language other than English; and 3) those in our major cities. The world is here. How will we respond?